To Dog With Love: New Book Helps Teach "The Best Dog Tricks on the Planet"
New Book Helps Teach "The Best Dog Tricks on the Planet"
I love teaching Rocco tricks. It's fun, entertaining and can help promote strength, balance and focus in your pup. And best of all it's a great way to create a special bond between you and your dog. We started with the basics -- sit, down, stay, come, etc., and then progressed to tricks like rollover, wave and walk backwards. 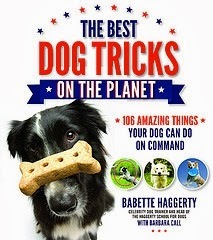 So we were interested in taking a look at the new dog tricks book "The Best Dog Tricks on the Planet," by Babette Haggerty and Barbara Call. The book shows step-by-step more than 100 tricks your dog can do on command. Each trick includes colors pictures, easy to follow instructions and trouble-shooting tips. What's nice about the book is that is starts with the basics such as sit, stay, down and drop it. 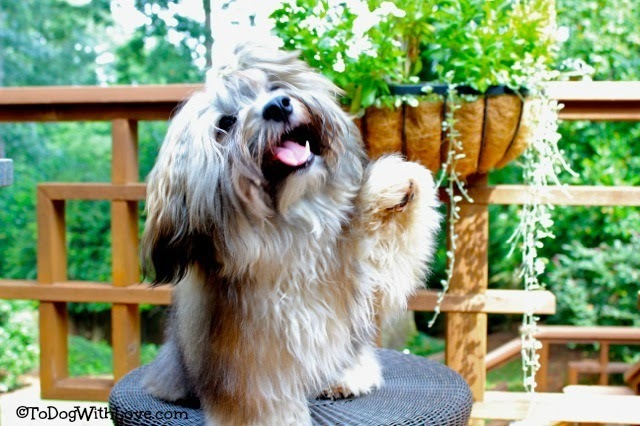 Once your pup has the basics down, it's fairly easy to move on to more complex tricks. The book also rates each trick as beginner, intermediate or advanced and it provides an idea of the average time it will take to train each trick. Many tricks in the book can be mastered in a week, though some may take longer. Many of the more than 100 tricks in were featured by Babette's famous father, Captain Haggerty, on David Letterman’s Stupid Pet Tricks. Captain Haggerty and his dogs appeared more than 25 times and was the original inspiration for the segment. We can't wait to get started on some more tricks. And next week, be sure to come back for a chance to win your own copy of "The Best Dog Tricks on the Planet ." Rocco practices his "roll over". I think I'd like to teach him to sort the laundry next! What would you like to teach your pup to do? Disclosure: We were provided with a copy of "The Best Dog Tricks on the Planet" to review and one to give away. Chester and Gretel don't know any tricks. Come to think of it, they aren't even trained very well :) I have been wanting to work on it more though. I saw this book but am glad to know that it would be appropriate for us even though we would basically be starting from square one. There's plenty of beginner stuff and tricks suitable for short dogs. However, I did set out to teach Rocco to cross his paws, but then I realized his little legs seem like they are too short to cross! I think that one may translate better on a leggier breed! Oh I heard about that book. Is it small dog friendly? We have another trick book but some of the tricks aren't physically possible for small dogs. 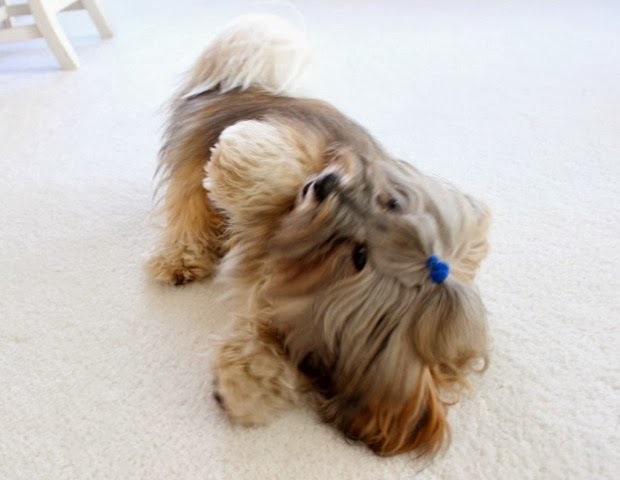 Some of the tricks do need to be adapted to small dogs, but there are plenty of tricks a small dog can do. In one of the tricks I looked at, like "paws up" which leads to "sit pretty" among other tricks, the author mentions using a low ottoman instead of a chair. When Rocco was a wee pup, I used a phone book to teach "paws". A very small dog is used as the photo example in some of the tricks too like pirouette, head up and down and bring me a tissue. My peeps would like me to do all house work. Not a chance. Have a fabulous Friday. heehee! I'd just like Rocco to put away his toys! Have a great day! Is there anything in there about teaching them how to write a blog post or post to our social media accounts? That sounds fun! We are all helping little Bailie out with her basic commands and are also throwing in a few new ones for all of us like roll over. Wow, Rita only knows the basics, and that's probably as tricky as we'll get. But, man, "bring me a tissue" and "sort the laundry" woudl come in handy! We need to get this book. Honey also likes learning tricks by I have a limited imagination. Recently, I taught her to close cupboard doors, push a ball with her nose, and jump up and touch a painted band on a utility pole. Unfortunately, they don't have much of a real world application. So maybe applying it to laundry, like you suggested, is where I should go next. Dogs love to learn new things! Great post! I'll have to check this out. It'll be interesting to see if I can teach multiple dogs at once too. Rodrigo would get a kick out of it. Heading to Amazon now!